Besides the changed default behavior of the gallery also new options to get notifications for session status changes have been added. Now you get by default an E-mail notification for each session you have started with some useful information like the connection details. You also get informed after a session has been stopped (either by you or the system). Those new notifications are configurable in your Artweaver Team settings in the new added notification section. Here it's possible to individually enable / disable notifications for each status change of a session. With today’s update to Artweaver Team we have changed the default behavior of the gallery regarding stopped sessions. From now on every stopped sessions is automatically added to the user’s gallery and visible for everyone. We hope this will increase the number of valuable content in the Artweaver Team gallery as well as encourage all Artweaver Team users to use this great feature. If you dislike this new gallery behavior it can be changed in the Artweaver Team gallery user settings to the old behavior where each session needs to be added to the gallery by hand. If there are any open questions, check out the help pages or contact us. 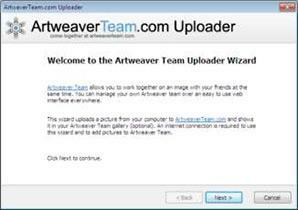 We're proud to announce that now a Plug-In for Artweaver is available which allows you to upload your events to Artweaver Team and restart them in a new session or just show the result in your personal Artweaver Team gallery. You can get this Plug-In for free from the Artweaver and Artweaver Team website and it works with both Artweaver versions (Free and Plus). 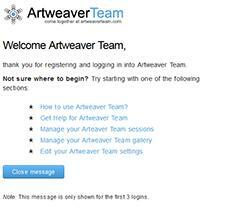 For all new users there is a welcome message shown for the first 3 logins to help them getting started with Artweaver Team. Besides some links to the help, settings and the manage page there is also a new help article which describes how to use Artweaver Team. 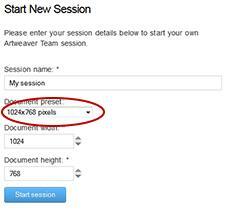 When starting a new session it's now possible to choose predefined document size presets from a list. This makes it easier to select the preferred document size instead of entering the width and height for the document each time by hand. Besides the new session restarting feature also the gallery handling has been improved. Now you can directly see from the new pop-up menu on the gallery page the number of views and downloads for each visible gallery image. 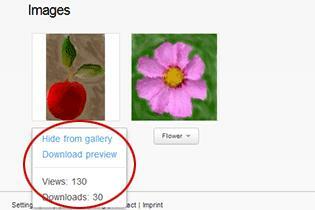 And there is also a direct menu entry to download the full preview of a gallery image too. So you don't have to visit the gallery page for a certain image anymore to get those information or to download the full preview.